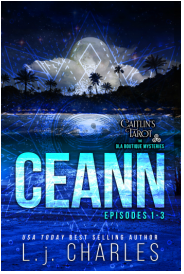 New to working with her Wiccan heritage, Caitlin casts her first circle with unexpected and disturbing results that lead her into uncharted territory. Hannah is still in jail. The person who killed Ted Thatcher is still at large. And Caitlin is determined to track down the real killer, even if it means she has to join a coven. involved puts him in the uncomfortable position of butting into a forbidden case--one his captain considers closed. when she's forced to confront hidden evil, she begins to accept the true beauty of her midnight energy. It's only a matter of time before Caitlin will need to unleash her power to balance the scales of justice. Hannah swears she saw one of the women alive, but did she? Two of the three women can’t be found. One is dead. It’s time for Caitlin, Hannah, and Ebba to trust the Tarot. A medium connected to the dead woman. And Caitlin Connor finds herself going toe-to-toe with not one, but two mafia families, who just happen to be fighting over the same parcel of land. They’re willing to eliminate anyone who stands in their way, including Cait and the women she’s trying to protect. The police need solid proof for an arrest, and the only evidence Caitlin, Jace, and Everly have is leads from Tarot cards, and conversations with a corpse—none of which are admissible in a court of law. Until Caitlin faces the killer. And discovers a new dimension of her midnight energy.